If you haven’t finished making plans for Labor Day weekend yet, be sure to add attending Marietta Art in the Park to your to-do list. This annual Marietta tradition has become a family favorite and Labor Day weekend staple for many metro Atlantans since it first started in 1986. Held at Glover Park, which is located in the heart of Marietta Square, this year’s event will run from Saturday, August 31 through Monday, September 2. The fine art extravaganza will feature an artist market, Marietta ChalkFest on Saturday and Sunday, Painted Pots, children’s art alley and Citrus Magic Pet Rest. Festival goers will be able to see artwork of all types, including, jewelry, graphic arts, paintings, photography and woodworking. Attendees are also encouraged to explore the rest of what historic Marietta Square has to offer such as shops, restaurants, museums, galleries and a walking tour. If you are interested in attending, free parking is available at the two Cobb County Parking Decks, and hours each day of the festival are from 10 a.m. to 5 p.m.
After you explore the art and historic Marietta Square, be sure to visit Traton Homes‘ community of Cobb County homes located within walking distance of the square. Montgomery Park is community of 45 luxurious Atlanta new homes in five brand new home designs priced from the low $300,000s. Features of these homes include spacious designs with 2,000 to 3,000 square feet of living space, master-on-the-main or master upstairs options, granite countertops, stainless steel appliances, hardwood floors, tiled bathrooms, elegant owner’s suites and more. The community is built in a traditional neighborhood design with community park, which makes spending time with friends and family just outside your front door easy. 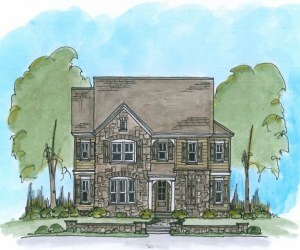 Children residing within these new homes in Cobb Count will attend highly sought-after schools, including Marietta High, Marietta Middle and West Side Elementary. To learn more about Montgomery Park from Traton Homes, please call 678-391-9492.